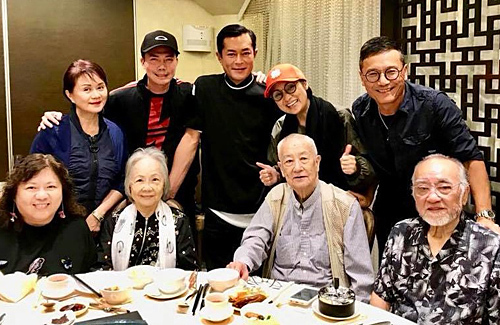 Known for being one of the most low-profile philanthropic celebrities, Louis Koo (古天樂) is the current President of the Hong Kong Performing Artistes Guild. His leadership has shown his kindness and respect for elderly artistes. Suggesting changing the usual yearly spring dinner held during March to a fundraising event to raise funds for elderly artistes, his attentiveness towards elderly artistes’ well-being was appreciated by others in the industry. Last year, former actress Yammie Lam‘s (藍潔瑛) death wasn’t discovered until two days after she had passed away. She had lived most of her retired life being supported by others. From Yammie’s tragic experience, Louis believed a new mechanism was needed to address the problem of aging artistes lacking financial support. With the Guild just earning a charity license, the 48-year-old actor proposed a fundraising charity event, so aging artistes could use those funds when needed. Further details on how it will be operated will be announced later, but many were already touched by Louis’ sincerity and regard for the elderly. In addition, insiders who interacted and worked with Louis before knows that he has always taken care of staff and the elderly from low-socioeconomic backgrounds. For example, during every prize raffle held at film celebration feasts, he would often fix the results and choose them to receive a prize. He also paid 200,000 yuan in an angioplasty procedure for senior artiste, Lo Hoi Pang (盧海鵬). Both were seen enjoying a Mid-Autumn Festival dinner along with Louis’s parents and other senior artistes last year, and the filial Louis was the one who paid the bill. This is news to me.. I have met Louis Koo on two occasions, once in Hong Kong and once in the States. Both times, he appeared very superficial and arrogant… almost to the point of being cruel. His words are harsh and his demeanor does not resemble that of a man who is caring towards the elderly. @mike Once I saw him in HK around the HK Cyberport area filming a commercial for some sports car. He was asked to drive the car, come to a stop, step out of the car, and say some lines etc. Well, I guess he had one too many takes and became frustrated and started barking at the crew. There were also some fans of his that went up to him to ask for photos and he just ignored them and walked away. His crew had to go up to the fans and apologize to them and ask them to give him space ‘cuz he’s working’. In the States, I was at a restaurant with some of my friends, late at night. He was there with about a dozen people. There were some girls sitting next to him and he was telling one of them to go and get him some drink or something and said it in such an arrogant way.. like I know you’re dying to serve me. Then he barked at a waitress cuz she was serving food next to him, said something like ‘use your brains, serve on the other side, you’re just here to be close to me’ I don’t remember the exact words.. but he was pretty rude. Well, it may be true that he’s just very sarcastic and doesn’t mean any harm.. but I didn’t like the impression he gave the two times I saw him. It’s true that we won’t like most Hong Kong people that we meet. They always seem arrogant and sarcastic because probably of all the years of coming from ‘what they think’ as a superior environment as compared to Mainlanders…. Same, I’ve never met him in person. He’s one of my favourite actors growing up, but he never gave me the impression that he’s kind, sincere and genuine from the multiple on-screen interviews that I’ve watched. If what is reported about him is true to its words then I think he’s an awesome human being and role model. Well, I don’t know anything about Louis Koo, but I hope this news is true! The growing elderly population across Asia is very vulnerable and often invisible to those of us with no elders or are too busy trying to “make it”. I recently read that 1/3 of Hong Kong’s elderly population are living in poverty for various reasons, and receive very little governmental, social, and familial support. So, I appreciate such endeavors by artistes to draw more attention to this issue. Yes, have never met Louis Koo, but have always liked him. Correct me if i am wrong, Louis set up a charity in China and has built many schools for underprivileged or orphaned children..? I think it’s been reported that he’s very low key with his philanthropy work, great for him. In the interviews i have seen of him, he appears to have a different/dry sense of humour. He has never come across as arrogant, but more straight up/blunt with some sarcasm. I have a relative that has a really horrible mouth. Everything he says is always mocking someone or arrogantly dismissing someone. But out of all my relatives, he has the biggest heart. He puts all his blood, sweat and money into building his family up (extended included). But he’s the biggest bossiest son of a gun I’ve ever met. I disliked him a lot when I was younger…I still don’t like him that much. And I avoid him as much as possible. However, that’s not to say I don’t think he’s a good person innately. I owe a lot to him, just can’t stand his attitude. Similarly, Louis Koo might give off a bad impression, but I think he might be a good person at heart. Yes. The manner in which Louis speaks is just a habit and it shows even in some of his comedies. His generous and supportive actions are what defines him as a person…. Glad you bought that up as I had an aunt like that. She is blunt, annoying, and has a bad attitude. However, she has a good heart and is very selfless to the ones she loves(she was not good to me but loved my brothers (her nephews) to death). Maybe Louis is that way somewhat? I never thought of Louis as warm and friendly but maybe he is the quiet one with a good heart? I also know people who sound all sweet and kind but do not do anything to help others. I have another aunt that has a sweet mouth but has a black heart. I guess it depends on the person and how they are on the surface versus how they truly are on the inside. He is one of the nicest celebrities I met! Maybe because he was busy filming so he didnt want to take pictures but I met him when I was in hong kong 3 years ago. I bumped into him on the street and got to talk to him for a bit. He was really kind and even suggested if I wanted a picture! He was by himself. I share the same sentiments with many of you. I recall seeing an old video of Jessica Hsuan answering questions from his fans regarding what she liked and didn’t liked about his personality (it was for his bday celebration). The video was muffled, but from what I can make out of it, she said that she liked that he is extremely direct, honest and loyal to his friends and would go lengths to help a friend in need. On the flipside, she said that he can be a bit rash and likes ‘picking fights’ (单挑). I don’t think she would have lied on such matters. So it appears to me that those old articles, about him using vulgarities on female celebs and showing violent tendencies on-set during his early-TVB days, were not entirely baseless. Yet, many of his then-friends and colleagues stood up for him, saying that he is introverted, doesn’t like talking, has few friends and has a cold demeanour but a warm heart. In that same article, Hsuan also defended him, saying that he might be rash and would use vulgarities at times, but would never turn physically violent on set. This appears to be contradictory to her later statements about him “picking fights” but it could also suggest that what she meant was that he has the habit of issuing verbal challenges like those “wanna fight?” statements. If we consider his early background: he started working in odd jobs after graduating from secondary school at the age of 15, mixed with people with triad backgrounds, got into jail in his early 20s, we might be able to empathise with the fact that he might have changed over a new leaf but some old habits die hard. I think he is not a ‘people person’, but he appears to be sincere in helping those who are suffering similar hardships he had encountered in his early years. He also seems to be quite distrustful of women. He was dumped by several women before he became famous, one of whom threw flowers he bought for her into the bin and another left him for his friend whilst he was in jail. He has since vowed not to buy flowers for any women in future. I’ve seen him in an interview, describing girls on film-sets as “House Flies” (苍蝇, and he went on saying that they couldn’t “enter” (initiate a conversation with him) as he would put on a stoic expression to fend them off. In his book, he wrote that it is easy to get girls from the clubs, but they aren’t girlfriend/wife material. So, monseenaddict’s claims might be true. He appears to have great disdain for girls who pester him for the wrong reasons.